High quality materials and workmanship offered in a standard format or in a customized size according to your specifications. 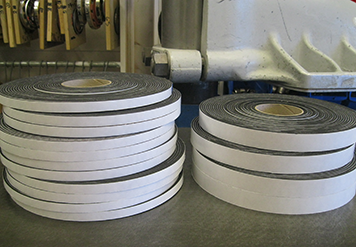 Wide variety is offered: manhole and handhole gasket, gauge glass and washers, cloth, tape, tadpole tape, sleeving, paper, custom fabrication, fire blankets and curtains. This technology, available with different types of expansion joints can absorb movement, reduce mechanical noise, compensate for misalignment and relieve system strain. Large inventory of quality products and military specifications available. Possibility of obtaining a product from a diverse offering, among others, ring and full face gaskets, spiral wound gaskets, O-rings and industrial plastics. Whether for an update or a specific tool, Hydro Silica can provide advice and offer you a good choice from a range of specialized tools such as gasket punches and gasket cutters. To facilitate disassembly or assembly of certain items, specialty products such as anti-seize compounds allow one to proceed safely. Hydro Silica provides a free estimation and diagnosis of your needs within a short period of time. With its high quality equipment and experienced team, Hydro Silica can perform customized cuts to your specific needs. Do not hesitate to contact Hydro Silica to learn more.